We have the cutest teacher today. His name is Nian Nian. Though he is very young, he is willing to teach you Japanese today. = Minasan, hajimemashite! Nian Nian desu. = Nice to meet you, everyone! I am Nian Nian. So today’s topic is how to use みたい ( = mitai). lesson on みたい ( = mitai) so here we go! = Inu de wa nai mitai. = Inu ja nai mitai. = Inu dewa nakatta mitai. = Shizuka dewa nakatta mitai. = Aniki mitai ni naritaku nai yo. = (Talking to his older brother) I don’t want to be like you. = I don’t want to be like my older brother. = Kare wa kodomo mitai ni warau. = He laughs / smiles like a child. = Oji mitai ni jiyuu ni ikitai. = I would like to live freely like my uncle. = Konpyuutaa mitai ni seikaku ni keisan dekinai. = I can’t calculate as accurately as a computer. Note: You sometimes omit auxiliary verb in conversation. = Kawaii doresu! Ohimesama mitai dane. = Cute dress! You look like a princess. = Dare? Ima, watashi no koto buta mitai datte itta no. = Who just said I look like a pig? = Sonna koto, itte inai yo. “Kobuta mitai (da)” tte ittan dayo. = I didn’t say such a thing. I said you looked like a piglet. = Kono niku, chikin mitai dane. = This meat is like chicken, huh? = Utaikata ga, shirouto ja nai mitai. = The way you sing is not like a amateur. = You sing like a pro. = Doushitano? Oshare shite. Itsumo no okaasan ja nai mitai dayo. = Wow, how come you dressed up? You don’t look like the Mom that I know. = Kawaii akachan desune. Oningyou san mitai. = What a cute baby. Just like a doll. Note: It is a common Japanese phrase. Use it if you want to praise a cute baby. = Kono fuku, bakamitai ni yasukattanda. = This clothes was ridiculously cheap. = Kono pan wa ishi mitai ni katai. = This bread is as hard as a rock. = Boku no kanojo wa moderu mitai ni kirei desu. = My girlfriend is as beautiful as a model. = Watashitachi wa kazoku mitai na mono desu. = We are like family. = Maggie mirai na inu ga hoshii. = I would love to have a dog like Maggie. = Konna kodomo mitai na kenka wa yameyou. = Let’s stop this childish fight. = Watashi ni totte, kare wa kamisama mitaina sonzai desu. = He is like God to me. = Musume: Shourai, otousan mitaina hito to kekkon shitai. = Daughter: I would like to marry someone like Dad. = I will buy you anything! = Dezunii ni iru to otogibanashi no sekai ni iru mitai na kibun ni nareru. = Disney Land make me feel like I am in a fairy tale world. = Mainichi, shigoto bakari de, yume no naka demo hataraiteiru mitai na ki ni naru. = I work very hard everyday. I even feel like I am even working in my dreams. = Kanojo wa, resutoran de taberu mitai na gochisou wo tsukutte kureru. = She (or My girlfriend) cooks great meals just like restaurant food. = Anoko ga motte iru mitai na baggu ga hoshii. = I want a bag just like she has. = Konna kawaii fuku wo kite iru to ohimesama ni natta mitai da. = I feel like becoming a princess in this cute dress. = Janiizu no nenmatsu konnsaato ni ikeru nante yume wo mite iru mitai desu. = I can’t believe I could go to the Jonney’s New Year’s concert. I feel like I’m dreaming. = Kare no kuruma no unten wa arai no de jetto koosutaa ni notte iru mitai datta. = The way he drives a car is so rough that I felt like I was riding a roller coaster. Note: You can replace みたい ( = mitai) with よう ( = you) . 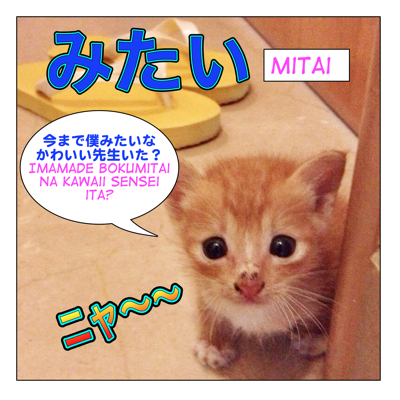 みたい ( = mitai) is more conversational. = Kono B&B de wa maru de jibun no ie ni iru mitai ni kutsurogeru. = I can relax at this B&B as if I am at home. = Sukaipu de hanashite iru to sugu chikaku ni iru mitai ni kikoeru. = I can hear you as if we were next to each other when I talk on Skype. = Itsuka nihon ni itte mitai desu. = I would like to go to Japan someday. = Konna sutekina hoteru ni tomatte mitai. = I would like to stay in such a lovely hotel. = Isshou no uchi, ichido wa faasuto kursau ni notte mitai naa. = I wish I could fly first class once in my life. = Kono kutsu wa, maru de kumono ue wo aruite iru mitai ni karui. = These shoes are so light it feel like I’m walking on the clouds. = Kono B&B de wa maru de jibun no ie ni iru mitai ni yuttari to kutsurogeru. = Kono hoteru wa youroppa no oshiro mitai ni utsukushii. = This hotel is as beautiful as a European castle. = Nian Nian sensei mitai ni kawaiku naritai. = I would like to be as cute as Nian Nian Sensei. = Neitibu mitai ni umaku hatsuon dekinai. = I can’t pronounce as well as a native speaker.Note: You can replace みたいに ( = mitaini) with のように ( = no you ni) in these example sentences. = Kono katarogu ni aru tana mitai nano nai? = Do you have a shelf just like the one in this catalogue? = Nanka nihon no omiyage de ii mono nai? = Are there any interesting Japanese souvenirs? = Furoshiki mitaina mono wa dou? = How about something like “furoshiki” (wrapping cloth) ? = Ocha mitai na mono nai? = Do you have something like tea? = Maggie sensei ga konshuu wa shukudai ga nai mitai na koto wo itte ita. = Maggie sensei was saying something like we don’t have any homework this week. 6) Colloquial usage: You may not find this usage in your text book. As Maggie Sensei explained in her 曖昧 ( = aimai) vague expression lesson, Japanese people prefer to avoid expressing their opinion straightforward. = ( literal meaning) I might be hungry. = (literal meaning) I might like you, Sho-kun. = I kind of like you, Sho-kun. 7) I heard ~: Telling someone what you heard or read somewhere. = Mari chan ga sukina no wa, Makoto-kun de wa nakute, Atsushi-kun mitai da. = I heard the person whom Mari likes is Atsushi-kun. Not Makoto-kun. = Hohoba oiru wa binkan hada no hito demo tsukaeru oiru mitai desu. = I heard Jojoba oil can be used by even those who have sensitive skin. = Kanojo no ie wa sugoku ookii mitai desu. = I heard her house is very big. = Tanaka-kun no atarashii kanojo wa kawaii mitai dayo. = I heard Tanaka-kun’s new girlfriend is cute. = Aite chiimu wa totemo tsuyoi mitai dakara ganbatte ne. = Do your best because I heard the opposing team is very strong. = Taifuu de densha ga tomatte iru mitaida. = I heard the trains stop due to typhoon. = Saikin, kuruma wo katta mitai dakedo, kondo, nosete yo. = I heard you bought a car recently. Can you give me a ride sometime. = Kachou wa kubi ni natta mitaida. = I heard the section manager got fired. = Kare wa mukashi no kioku wo sukkari nakushita mitaida. = It seems like he lost all the past memories. Note: This usage of みたい ( = mitai) is similar to そう ( = sou) and らしい ( = rashii) and a lot of time they are interchangeable. = Kare wa saikin, kanojo to wakareta mitai desu. = I heard he just broke up with her. / It looks like he just broke up with her. = Kare, saikin, kanojo to wakareta mitai. = Kare wa, saikin, kanojo to wakareta sou desu. = I heard he just broke up with her. = Kare, saikin, kanojo to wakaretan datte. = Kare wa, saikin, kanojo to wakareta rashii desu. = Kare wa saikin, kanojo to wakareta rashii. 8) みたい ( = mitai) can be used to tell someone what you heard and also to express your assumptions. = Chotto netsu ga aru mitai nanode kyou wa hayaku kaerimasu. = I think I have a fever so I will go home earlier. = Mada omise yatte iru kanaa. = I wonder if the place is still open. = Kono jidou hanbaiki wa kowarete iru mitai dakara tsukawanai hou ga iiyo. = It seems like this vending machine is broken so you shouldn’t use it. Now let’s compare verb + みたい ( = mitai), verb +そう ( = sou) and verb +らしい (= rashii) here again. = Kono ringo wa kusatte iru mitaida. 1) I heard this apple is rotten. 2) It looks like this apple is rotten. But そう ( = sou) and らしい ( = rashii) are only used for things you have heard. = Kono ringo wa kusatte iru souda. = I heard this apple is rotten. = Kono ringo wa kusatte iru rashii. Please go check the lesson on そう ( = sou) and らしい ( = rashii) if you want to learn more. = Nian Nian Sensei arigatou! = Thank you, Nian Nian Sensei! = Nian Nian sensei mitai na chiisakute kawaii sensei wa imamade imasen deshitane. = We have never had a teacher this little or cute before. = Mata oshieni kite kudasaine. = Please come back to teach here. If you use みたい in the past tense does that mean the the “similarity” no longer is true? In other words, if you say, “かわいかったみたい”, then the person is no longer cute today? かわいかったみたい。= I heard she/he used to be cute. It states how cute that person used to be in past and it doesn’t mention the current state. It changes the nuance depending on the particle as well. If you say Ex. 彼女は昔もかわいかったみたい。It means she is cute now, too. But if you say 彼女は昔はかわいかったみたい。 It insinuates she is no longer cute. You said that そう ( = sou) and らしい ( = rashii) are only used for things you have heard. 2nd question is “Is rashii in this sentence natural? Like this use of rashii, is it common among native Japanese people? Yes, it is a natural sentence and it is very common. And yes, as I said, you use らしい based on the information of what you have heard/seen/read. So then can I use, 助詞は私の得意じゃないみたい。? Or is there some other device to convey “It seems that…/Apparently…” about something about myself? Or, is this just an odd sentence that one wouldn’t find in Japanese? Another example, Maggie-sensei is such a great teacher and so you receive a lot of positive feedback. So how would you, Maggie-sensei, say “[Apparently I’m]/[I seem to be] very popular” ? Your friend is right. You don’t use らしい when you talk about yourself. Haha, I am embarrassed to translate the last sentence but you can use みたい・よう. I am confused as to the difference between よう and みたい. In the first one, it seems to me that it is uncertain whether the person is a student or not, only that he gives off a student-like atmosphere. However, which the second one, I read that it is implied that he only LOOKS like a student, but isn’t. However, with this sentence, it supposedly means that it may or may not be sold out. I do not understand how, in the first example, みたい can mean that he only looks like and is not (which is different from よう), but in the second example, みたい means the same thing as よう. 学生みたいです。You are right. You can’t tell just by this sentence whether it means 1) He looks like a student or 2) I heard he is a student. もう売り切れみたい。could also mean 1) It looks like something is sold out. (the speaker’s judges from what he/she saw. 2) I heard it’s sold out. You only can tell by the context. The examples 3 seem to be noun + みたい and not verb + みたい… or am I understanding something wrongly? Your lessons allways nicely explain the topic, thank you for your hard work. … or such sentences are not actually common? Regarding this sentence, does it mean they HAD found the teacher that looks like Nian Nian sensei? Or they hadn’t? As I wrote, it means we have never had this little and cute teacher like Nian Nian Sense (until now). I see! But what if there hasn’t been any teacher who’s little and cute like Nian Nian sensei instead (we still don’t have one now), do we say: “Nian Nian先生みたいな小さくてかわいい先生は今までいません。”? To answer your question, let me change the example sentence. In this blog, we have never had a guest teacher of elephant. Dezunii ni iru to otogibanashi no sekai ni iru mitai na kibun ni nareru. yume no naka demo hataraiteiru mitai na ki ni naru. why it use “ki ni naru”? oww!! kibun ni naru is potensial form?? how do we form like that?? i only know the potensial form just to add eru n rareru!! do u have lesson about this?? and can u explain me more abot adverb !! Oji mitai ni jiyuu ni ikitai. Konpyuutaa mitai ni seikaku ni keisan dekinai. i’m wondering, why it use ni after jiyuu and seikaku?? Did you see my そう lesson? For example you are looking for something and can’t seem to find it. = It seems like it is not here. = It seems like Maggie doesn’t have any money. This is one awesome article ! I really liked how you covered all kinds of usages of みたい. I was searching for this everywhere T_T. If I understand this correctly, いつも is noun here and ぼんぼんってして the action /verb here ? Am I correct here Sensei ? Glad to hear you liked the lesson. ぼんぼんってして →ぼんぼん= onomatopoeia to modifies a verb, する, but in colloquial conversation you can think ぼんぼんってする as a verb. [Hohoba] oiru wa binkan hada no hito demo tsukaeru oiru mitai desu. I heard [Jojoba] oil can be used by even those who have sensitive skin. Thanks! This lesson helped me understand this subject better. I just have one last doubt. If I am not mistaken, there is another expression that is similar to mitai: “something” ni mieru. Is there any difference between mitai and ni mieru? As you see, there are many usages of みたい but one of the usages of みたい ( = mitai) is similar to にみえる(=mieru) but they are slightly different. マギーはきれいにみえる= Maggie looks beautiful (to me). Sometimes we use them both. = You looks like her father if you are next to her. Wow this word has a lot of usage! I only knew “looks like~” and “to want to try something” like 行ってみたい. Thanks for the lesson I really enjoyed it very useful information! Thank you for your comment. Good! I will add てみたい form in the lesson.